Above is a tighter crop of Polyrachis sp. Identified by their armoured, flat body and spiny petiole. Camponotus (compressus?) - The above image probably shows a Major Worker of Camponotus sp. 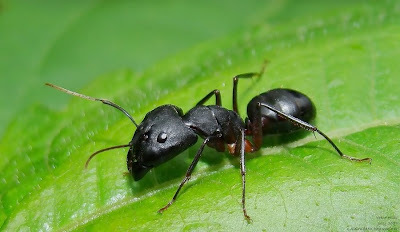 As everyone is familiar with the caste system of Ant colony - Queen and Drone, Workers and Soldiers, so on... there is sub-caste system also - literally distinguishing worker ants based on their size and shape. Thus, there are minor, median and major workers. Tetraponera (allaborans?) - An arboreal ant, this glossy cute little ant with big eyes can be identified up to the genus level by only looking at it. It's slender body, a uniquely shaped gaster and the walking pattern tell us that it is Tetraponera. 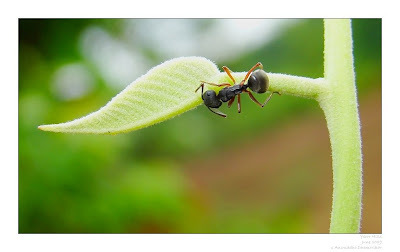 This perticular ant will always scan the leaf edges - as also seen in the above picture. I noticed several individuals on approx. 30 cm plants. Tapinoma sp. - A really tiny ant, photographing it through a digi-cam becomes impossible. In the above photograph, you will notice small ants on a dead moth which was probably preyed upon by a spider. Tapinoma sp. 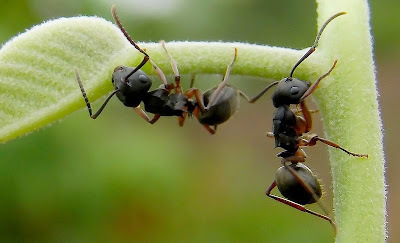 of ants are also called Odour ants since they give out a specific odour, wikipedia notes that odour as that of "pungent coconuts". The species sessile is the highly distributed of all, also commonly seen at homes. Fly - Another interesting but gross looking fly. It probably belongs to Bombyliidae - I am not sure. It was big in size. And uglier. But none the less a curious creature of the woods! Katydid - Family Tettigoniidae, commonly also called as Bush-cricket, they are the cousins of Grasshoppers. They prefer living just like Grasshoppers, in a well vegetated forest and feed on leaves. Distinguished easily from grasshoppers by a rounded abdomen, extremely long and thin antennae and thin legs as compared to the grasshoppers. A misnomer for these is "longhorn grasshoppers", although they are not grasshoppers, but even closely resemble Crickets (see below). Cricket (Family Gryllidae)- A creature of darkness, they wander out in the open during dark and prefer to live well hidden during day time - such as under stones and fallen logs. They are easily distinguished by a strong and stout body, stong hindlegs as compared to grasshoppers and katydids. They are omnivorous and may also devour their own dead. An interesting note from Wikipedia - "Crickets are popular as a live food source for carnivorous pets like frogs, lizards, tortoises, salamanders, and spiders. Feeding crickets with nutritious food in order to pass the nutrition onto animals that eat them is known as gut loading. In addition to this, the crickets are often dusted with a mineral supplement powder to ensure complete nutrition to the pet." Otheris sp. - A large moth that was seen resting in a thicket, it measured atleast two inches in length. 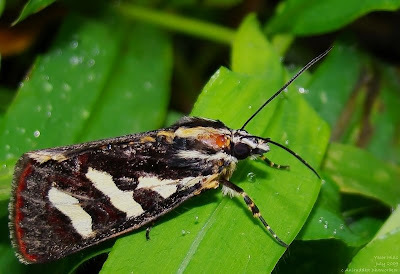 It belongs to Noctuidae, Catocalinae. The hindwings of this moth are bright orange with two black spots. Agaristinae sp. - A beautiful moth, this specimen was damaged though. Yellow Orange Tip: Ixias pyrene - A wet season form of the male. Common Indian Crow: Euploea core - A beautifully dark butterfly very common all around us. Common Bushbrown - Hard to give it's specific name, the Wet Season Form of it looks beautiful! Long Brand/ Dark Brand Bushbrown - An unidentified species, this fellow was larger than the earlier image. The Wet Season Forms come on the darkest of the colour combinations, and most beautiful ones at that. Land Crab - Several big land crabs are seen walking on the forest trails. After a few days of heavy rains, the baby crabs come out of their mother's nursery. This is one of those babies, hardly measuring a cm. 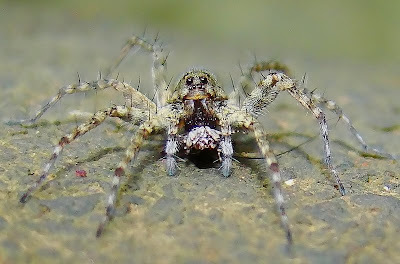 Wolf Spider - I had pleasure photographing this tiny Wolf Spider. It was really small and well camouflaged against the cement pipe. After seeing the image did I notice it feeding on something! Wolf Spiders are interesting spiders and easily identified by those typical eye-pattern - Two large eyes on top and four lined below it, and two more just behind the two large ones. They are ambush hunters and do not make webbed homes. Spitting Spider - Belonging to Scytodidae, they are one of my favourite spiders. I was lucky to find good sized fellows - healthy and strong ones - which make it easier for my camera to capture the details. The above image shows the spider typically sitting 'neath the leaf surface, however they usually fold a leaf and stay inside it. Spitting Spider (Scytodidae) preying on an Orb Weaver (Araneidae): This was the most interesting documentation of a Spider-related-foodchain. Spitting Spiders do not build webs like Orb Weavers, so this Spitting Spider had probably captured an Orb Weaver unawared - outside its web. Spitting Spiders are aptly named, since they truly spit. However, their range is within 20mm, so capturing an Orb Weaver from it's Orb-shaped-web is an impossible task. Hence it's my theory that this poor Orb Weaver was on the leaf-surface, unaware of the danger. The fight and the struggle for the survivor of the fittest must have been fascinating! Lynx Spider (Oxyopes superbus? )(Above and below): Two beautiful brightly coloured Lynx Spiders, unidentified as yet, were seen feeding on Hoppers (we spoke of earlier). Many hoppers = ample opportunity = plenty prey = full tummy = happy spider = good photograph! Giant Wood Spider: Nephila sp. - A wonderful Giant of the Webs is a common sight after the onset of monsoon. This is the season for smaller ones, and as days grow older and monsoon comes to an end, they will be in their biggest of sizes. A full grown Nephila will build webs at great heights. Many fear these spiders for their size - but let me tell you, they are harmless. And beautiful, not to forget. The males are very tiny and often confused to be spiderlings. Dome/Tent Spider - Belonging to the family Araneidae, this spider however does not make the typical Orb Web. It makes a rather unusual and beautiful form of web that is shaped as a dome. The spider rests just below it's dome. This dome shaped web is often changed as it gets damaged. Above image shows a beautiful coloured Dome Spider in it's home. The image below show's another Dome Spider - probably different species as the above one - that has captured a Horsefly (we spoke on, on previousYeoor Post) - an example of how Spiders help control pest population. Crab Spider - Of the Thomisidae family, this one is the most unusually shaped fellow Crab Spider I have ever seen. Unidentified as yet. Unidentified Frog - There were many tiny frogs near a stream (where the Wolf Spider was photographed). Lastly, an image depicting hope, wish and blessings for this beautiful, common yet uncommon, easily underestimated place. It is in your eyes to see beauty, for beauty lies in the eyes of the beholder.